The year is almost over and I figured it’s time for one more update on my 101 list progress. One of my favorite goals was #52, go a Chicago Bears game. I haven’t been to Solider’s Field in a long time (not since before the new stadium), so I have been looking forward to doing that for a while. The positive side of the Bear’s dismal season is that tickets are dirt cheap now. 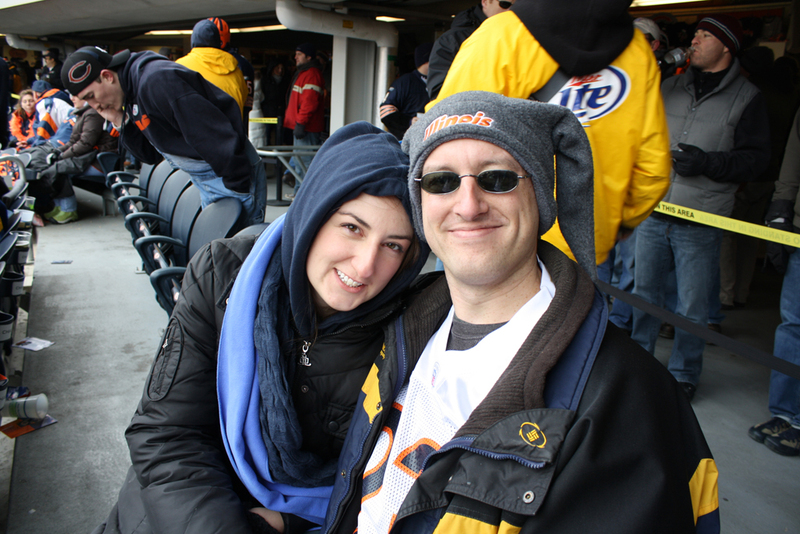 So me, heather and my parents went to the Bears-Rams game. We got some greats seats, 19 rows up from the field. Although it was pretty cold outside, we had a blast and can’t wait to go back again (it was also one of the few games they actually won this season). I finally made a bit of progress on #10, 5 acts of kindness. My parents have a hankering for Italian Lunch meat (which is somewhat hard to get in Wisconsin), so last week, I went to the deli for them and picked up an order of groceries. I had thought it would have been a 10 minute trip, but apparently everyone was stocking up for Christmas meals and it took me a good 45 minutes to get in and out of there. I was able to reap some of the benefits as the sampled some while we were up there, so that was nice. Hope you guys enjoy the food. One to cross off the list that actually required a bit of work was #33, get a new belt in Tang So Doo. I think it has been almost a year since I last tested, and I survived many classes, as well as breaking my toe (a bit of a setback). I went through a 2 and a half hour test, and in the end, I passed. 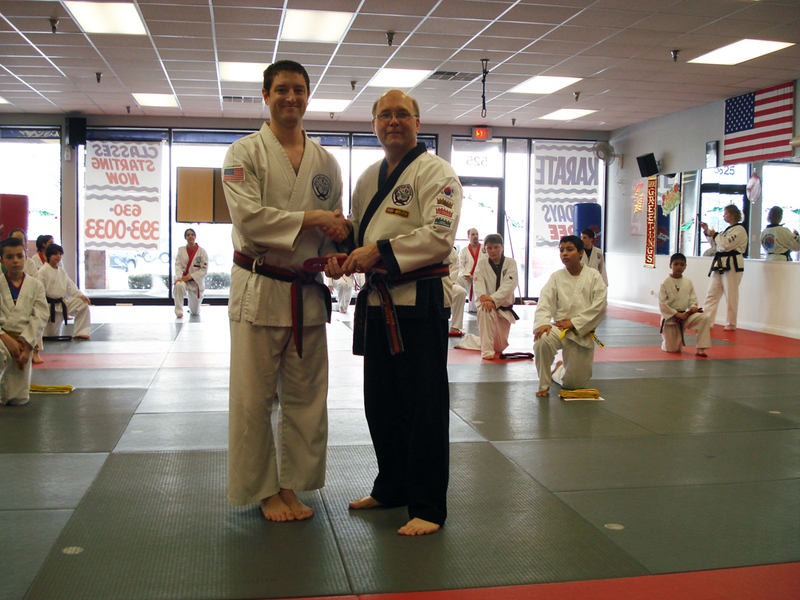 During the graduation, I was even able to break the boards I needed too on my first try. So that was good. Only 2 more belts to go before black. But I still have a long way to go as far as I’m concerned. I made my first bit of progress on #67, read 5 new fiction books. This one had been sitting on my shelf for a while and I finally got around to reading it. The book was The Lone Drow, part of a fantasy fiction series I have been reading. It was better than I had thought it’d be, my only gripe is the publisher cheaped out and the print is super small. Either that or I’m just getting really old. Maybe both. Oh well, 4 more to go. Similiar to the last one, I made my first bit of progress on #99, add and watch 5 dvds to my collection. This one was Star Trek. I saw it in the theater and absolutely loved it. So I made sure to pick it up when it was released. It did take me a couple of weeks to carve out the free time to watch it. But it was just as entertaining as the first one. I’d highly recommend it if you haven’t seen it. My last update for the year would be to cross off #18, Spend an evening relaxing and finish a bottle of wine together. For our own Christmas this year, we spent Saturday together. I made a nice dinner of Filet Mignon wrapped in bacon and lobster tails. We cracked open a nice bottle of red and just relaxed on the couch. All in all it was a nice relaxing evening. Well that’s it for the year. 15 goals out of 101 crossed of the list. Many more started. I still have hundreds of days left, so I’m not too worried. I hope to have a lot more progress made as 2010 comes to a close. We are enjoying the lunchmeat, glad we could help with #10!!!! State of the List Update.